How can an individual or business use a .College domain? Do you consider yourself an excellent chef? How about a domain like CookingTips.College to showcase your recipes or photos of your cooking ventures. Or if you’re an arts and craft fan, you can use DoItYourself.College to build a community of DIY lovers sharing how to’s, best practices, and testimonials for fun projects. Brands and businesses can use .College domains, too. With a .College web address, you’ll get immediate recognition as a college-related site or campaign and attract your target market. It’s perfect for recruiting or marketing to college students, or even as an online hub for employee training. We can’t wait to see what types of innovative uses #GenXYZ will bring to .College. Did I hear someone say SportsHighlights.College? 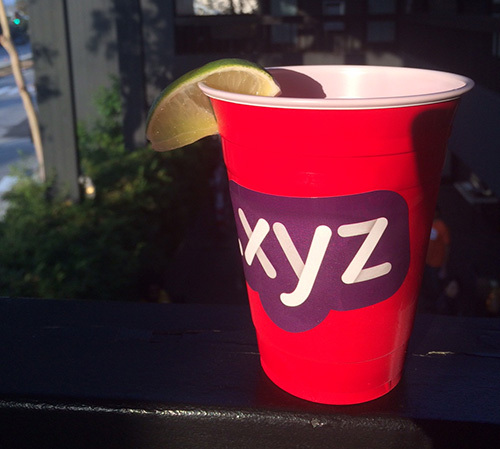 Tweet us @xyz and let us know how you’re planning on using your .College domain. Don’t forget to follow @College for the latest .College updates, too! It sure has been a busy September, #GenXYZ. At the exact same time as ICANN’s GDD Summit in LA, the #XYZsquad was also in Beantown for INBOUND, the colossal marketing conference where over 10,000 people traveled from around the world to discuss the future of marketing. The keynote lineup with Seth Godin, Brene Brown, and Aziz Ansari, is telling enough of how INBOUND is the place-to-be for any savvy marketers. So what was Team XYZ doing at INBOUND? With our trusty domain partner in crime, Rebel, the #XYZsquad hit the streets of Boston and the Convention Center to educate INBOUND’rs on the online marketing opportunities with .xyz and new domains. And a success, it was! Can you guess where they’ll venture to next? 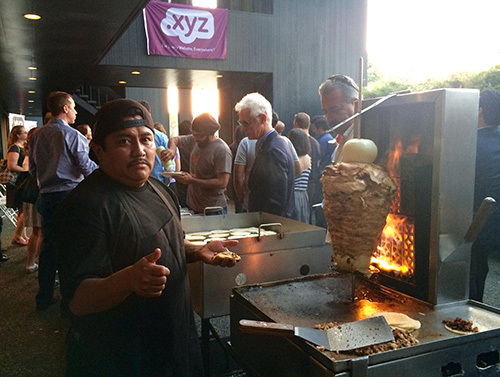 The best way to stay in the loop is to sign up for the XYZ newsletter here! BIG NEWS, #GenXYZ! .College, our second ever domain is now available to register by anyone. After a six month long university-exclusive registration period where some of the most prestigious educational institutes in the US and UK secured their domains, .College is now open for all. That puts .Rent and .College in both of their Early Access Periods, which is a special 7 day priority registration period where those early adopters and fast actors have the chance to get the domain names they want at a premium price. Clearly, the new domains space is growing. Celebrating this growth and collaborating on ways to make the internet an even better place, ICANN (the organization behind the entire internet naming system) hosted its inaugural Global Domains Division Summit earlier this month. Everyone from Team XYZ participated in the Summit, including several members of the #XYZsquad! The Summit brought together the players in new domains to discuss and jointly improve the industry. With so many of our business partners spread across the globe, it was great to have face-to-face time and show them what Silicon Beach is all about. Even though we distracted you with awesome party pics and flips, we know you’re still thinking about how you can get Early Access to your .College and .Rent domains. To learn more, visit go.college and register.rent for details. Election season excitement is back here in the US. But did you know? Even with all the media coverage and political chatter, last national election saw the lowest voter turnout in 72 years! Hunter Scarborough wants to solve this issue of low voter turnout with his Tinder-meets-politics app called Voter. At his previous job, he was working 12-14 hour days and didn’t have time to research quality news to make an informed vote. To help the rest of us busy Americans, he looked to technology to develop an app that would allow us to quickly (and enjoyably) make informed decisions. Team XYZ recently had the opportunity to meet Hunter at our SoCal Domainers Meetup where he told us the backstory to Voter. 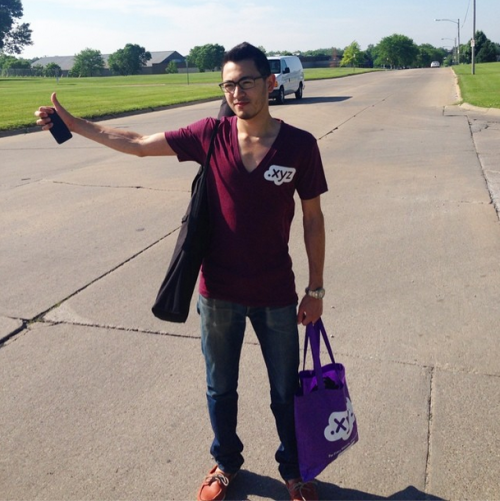 It must’ve been fate that brought us together, because he was in the midst of the transition from Voterapp.us to Voter.xyz! New to the #GenXYZ family, Hunter let us pick his brain about his new company. 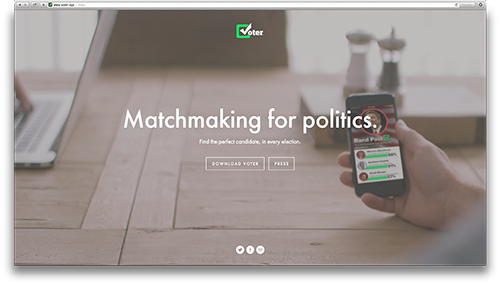 Team XYZ: Your app, Voter, is said to be the Tinder for politics. What was your inspiration for the app? Hunter: During the 2012 presidential race, I became frustrated by how difficult it was to find political news sources I could trust. I wasn’t going to vote based on a soundbite from an uncle or a news anchor, and the only alternative was time consuming personal research. I thought there had to be a way to leverage technology to give me confidence in who I was voting for. Looking at the wealth of raw political data becoming available, I developed the concept for Voter, essentially online dating, for politics :) In order to keep things fast-paced and engaging on a topic that is usually anything but, we applied a tinder-style UI, where users simply swipe cards to indicate their positions on political issues. X: Since your product is a mobile app, why did you create a website for it? H: We felt it was important to have a hub, where users and potential users can go to get information about Voter, where they can download it, and how it works. We are planning to expand the site into an online version of the mobile app, giving the Voter platform broader accessibility. X: Your site was previously Voterapp.us but you recently made the switch to Voter.xyz. How did you decide on the switch? We cover everything under the umbrella of voting, from x, to y, to z. We use algorithms and objective, numerical data to find voters their ideal candidate. Xyz fits well in supporting our mathematical solution to voting information. Our target demographics are millennials and younger voters, specifically generations x, y, and z, which makes the new domain all the more relevant for us. X: How do you think your .xyz domain will resonate with your audience? H: I think it will resonate exceptionally well, especially considering recent .xyz press such as hooli.xyz (HBO’s Silicon Valley) and Google’s new parent company, Alphabet. X: Anything else you’d like to share with #GenXYZ? H: We are big fans of .xyz, and are proud to be using the domain :) Greatly enjoyed meeting Daniel and the XYZ team last month! And that’s it from us! Don’t forget to download Hunter’s app at Voter.xyz and find your political match. Do you know who you’ll be voting for this season? Send us a tweet at @XYZ! Presenting: The Challenge Round 2 winners! This past summer, we challenged internet users from across the country to submit their best .COM or .XYZ domain name. After a great Round 1, we’re excited to announce the winners of Round 2. Things definitely heated up with this final batch of submissions! But before we announce the winners, we want to give a huge thanks and a digital round of applause to our 3 judges who spent this past weekend picking out our 2 winners. Konstantinos Zournas – He’s a seasoned veteran in the domain space and is most known for his blog, OnlineDomain. You probably also recognize his name because he judged both rounds of The Challenge! Morgan Linton – Such a versatile guy. Not only does he run a successful domain blog, he also runs a fashion startup with his wife. Jason Thompson – If you live in Southern California and are involved in the domain industry, you’ve probably met Jason. When he’s not busy with DNPimping, he organizes the SoCal Domainers Meetup group. “Reflective Sunglasses” is a popular exact match keyword with 1,080 Monthly Searches, High Competition and $1.37 suggestive bid from Google Adwords. Having registered many domains in the past, this Challenge taker is in-the-know with what makes a good domain. Curious about the other submissions? There were so many great submissions (and by great we mean everything from short, brandable domains to clever, quirky, and just straight up unique domains), we would be doing a disservice to #GenXYZ if we didn’t share. Along with some interesting survey findings, we will publish all submissions in an upcoming blog post. Stay tuned! What do you think of the winners? Leave a comment or tweet us @XYZ! We’ve been looking deep through the XYZ archives and have found gems of gems that we’re excited to uncover! 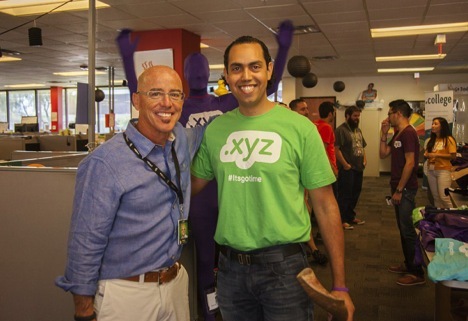 This was the month that .xyz globally launched and we visited our friends at GoDaddy on an epic road trip. We couldn’t think of a better way to honor this exclusive deep v with a website of its own: deepv.xyz. As the team behind the versatile domain for every website, everywhere, we wanted to also express the versatility of the deep v itself. Whether you’re running a meeting, on the go, or out socializing at the club, the deep v is all you need. This one’s a #TBT because we’ve discontinued the special deep v. But who knows. With the ever increasing demand for these, we just might bring it back. Where would you sport your .xyz deep v? Tweet us @xyz and let us know! 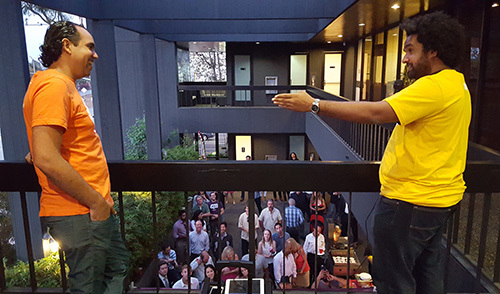 We had a blast co-hosting the Southern California Domainer Meetup at the XYZ Santa Monica office last week. The turnout was great and more than we imagined. With over 80 attendees – and Armin van Buuren blasting in the background – it was a happening night, to say the least. Amongst the mingling, we had made-to-order tacos, refreshments, and a speech from our CEO Daniel Negari, who also announced the judges for the current round of The Challenge. For this round of The Challenge, we’re excited to announce that we have 3 amazing judges who not only have knowledge and expertise, but also a passion for the domain space: Konstantinos Zournas, Jason Thompson, and Morgan Linton. You probably recognize Konstantinos’ name from Online Domain, but also because he was the judge for Round 1. Being the industry celebrity that he is, we just had to invite him again! Jason Thompson is the organizer of the SoCal Domainers Meetup, and also runs JasonThompson.co and DNPimping. Naturally, he’s a great fit to be a judge. And last but not least, Morgan Linton is a veteran in the domain namespace and is busy running his Austin-based startup, Fashion Metric. He wasn’t able to make it in person, so he surprised us by calling in to say hello to the Meetup crowd! Fun fact: Morgan and Jason are the founding fathers of the SoCal Domainers group! Their first Meetup had less than 10 people in a small bar in Downtown LA. #GenXYZ, there’re only 1.5 weeks left until submissions for The Challenge close! Remember, there will be a winner for both a .COM and .XYZ domain. What would do if you won $1,000? Tweet us @XYZ! Speaking of going back to school, this week’s #WebsiteWednesday is dedicated to unique ways students can use their .xyz domain. Whether you’re a student looking to show off your skills, a high school student applying to college, or even a group running a project, having an online presence is the key to standing out. Ever Google a product before you buy it? That’s exactly what employers are doing when you’re a prospective employee. You might be thinking “eeks!” but no worries – this can be a good thing! Having a website for yourself or your organization is the perfect way to express yourself beyond the standard resume or job application. Protip: Make sure your domain name is relevant to you or your project and is memorable! We’ve seen a lot of student sites being used as resumes, so here are 2 unique examples of students rocking their .xyz domains. We also love these because they incorporate XYZ into their social media accounts for a cohesive look across all their online channels! Talk about brand savviness. Remember, you don’t even need to be a developer to have a website. 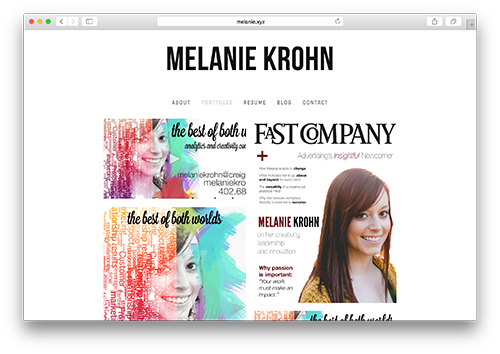 Melanie is using Squarespace to power her site, and there are loads of other web builder options like WordPress and Wix. 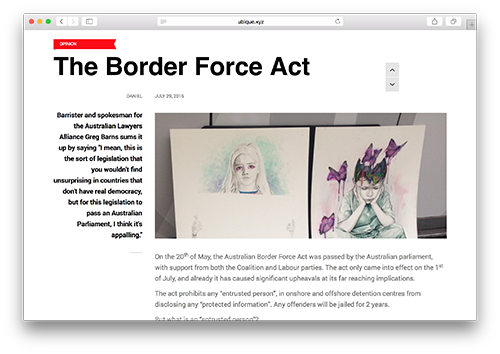 Ubique is unique because they are an Australian high school organization that uses their website as a online platform for their student magazine. It’s been some time since the XYZ team has been in high school, but we sure didn’t have anything like this back then! What else can you do with your domain? Submit it to The Challenge! We’re awarding $1,000 to the best registered .COM and .XYZ domain. Submissions close 9/3/15, so hurry! In LA? Join us for this month’s SoCal Domainers Meetup, hosted by yours truly. Look forward to street tacos, refreshments, and an exciting talk by our CEO Daniel Negari. We’re thrilled to have TWO special new judges for Round 2 of The Challenge, which will be revealed at the Meetup. Be sure to RSVP for the event! Whether you can attend or not, you’re still invited to take The Challenge :) The drill is the same – register the best .COM or .XYZ domain you can find, and you’ll be entered to win $1,000. Hope to see you all at the Meetup this Thursday! I’m going to be launching a free, online, automatic transcription service, and releasing the source code open-source. Transcribe. That is what the site will do. Like most open-source projects, they tend to pick the name based on the primary function. It’s short and sweet. Every iteration of Transcribe I could think of was registered. .XYZ gave me the most succinct solution! The slate is now clean and Round 2 of The Challenge is open for submissions! The drill is the same. Register and submit the best .COM and .XYZ domains you can find through September 3, and you’ll be entered to win $1,000! People must’ve been shy because there were about 30 total entries. With great deals like $1 .xyz domains at Namecheap, it makes it that much easier to participate in Round 2 of The Challenge! For our international #GenXYZ’ers, what domains would YOU submit to The Challenge? I know you might not want to share your stellar domain ideas, but if you’re in a particularly sharing mood, tweet us @XYZ and let’s see what you got!